Join artist/author Gina Cannone and enjoy this one day workshop on the art of paper quilling. PAPER ART is for everyone! Quilling or paper filigree is an art form that involves the use of strips of paper that are rolled, shaped, and glued together to create decorative designs. 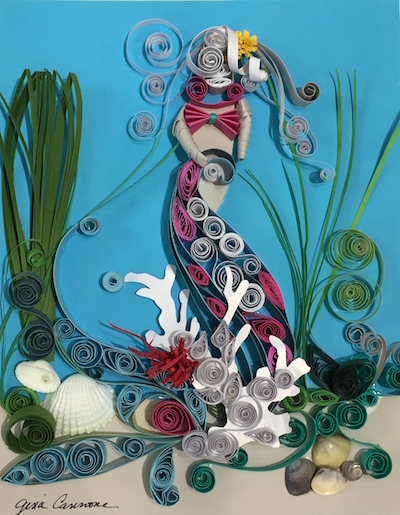 LEARN this fun and addicting ART form to create this adorable mermaid. Supplies included. Saturday, May 18th from 10:00am – 12:45pm. Class size limited to 15 students ages 12 – adult. Workshop Fee: $65, includes all materials. Pre-registration is required. NOTE: Online registration closes at 5pm on the day prior to the start of class. If you would like to register for this class after online registration has closed, please contact us at mainavegalleria@optonline.net or (732) 988-1002 for more information.